UPDATED REVIEW - February 1, 2019 - Digital Grand Pianos - What to know in shopping for one! 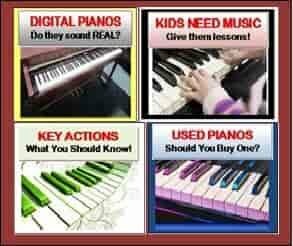 - Digital Baby Grand Pianos including full featured ensemble & music functions are lots of fun to own! I receive many inquiries from people who are looking for a good digital Baby Grand piano but don't want to sacrifice quality for a low price. 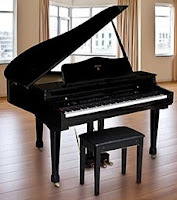 In this Digital Grand Piano buying review, my goal is to help educate people on good digital Baby Grand Pianos and what is available with regard to various brands and price ranges. The sizes of these pianos can be the small mini sizes which are less than 3 feet deep on up to 5'3" deep (front to back). 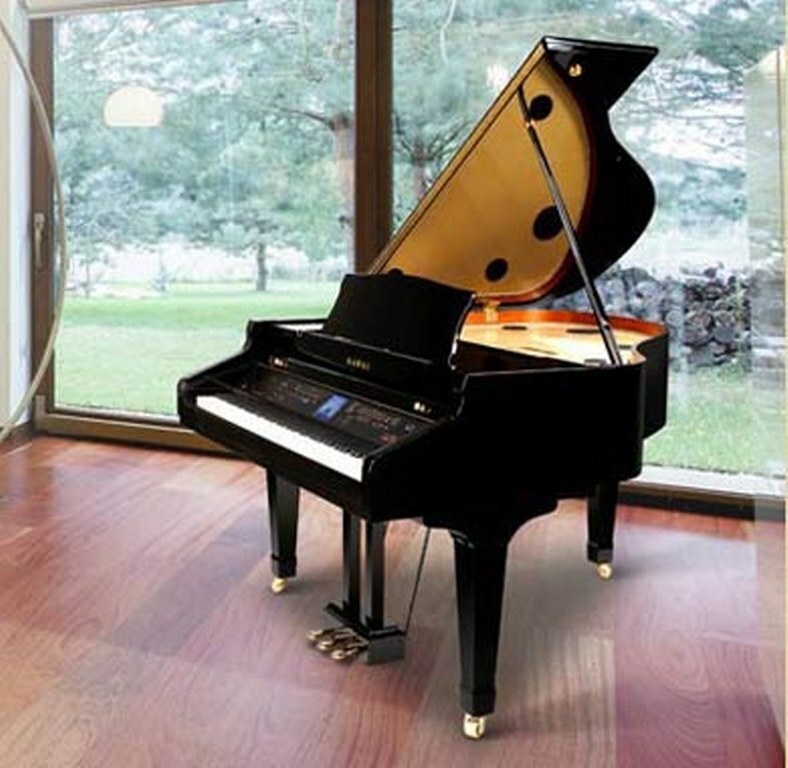 Price is not necessarily an indicator of cabinet size so you need to decide what size piano will be best for you. However typically the larger the piano, the bigger and fuller the sound will likely be. 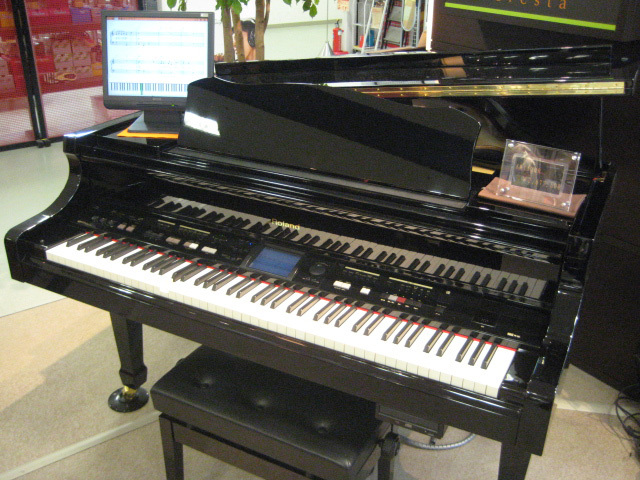 The Kawai CP1 digital baby grand is the ultimate example these days of a digital piano in a large 5'3" baby grand cabinet with authentic furniture design and construction along with impressive digital electronics and features. 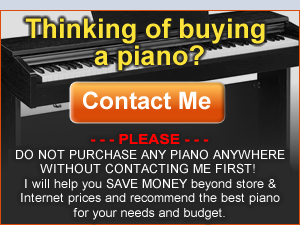 *BEWARE: If a new digital grand piano you are seeing is on a Craigs List ad or linked to an Amazon ad, then that piano is likely low quality in a number of ways and I recommend you ask me first before you buy! 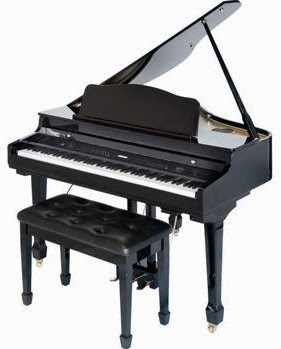 Many of these so called "good digital grand pianos," regardless of how good they look on the outside and regardless of what the piano maker/seller has to say about it (they always say glowing things), are possibly just PSO's (piano shaped objects) with little similarity to what a real piano does or how it actually plays. So don't be fooled by "looks" or flowery statements made by the manufacturer or the salesperson trying to sell it...they just want their Amazon affiliate payment or commission. If the piano does not have a good key action, piano sound chip, pedaling system, and good name known throughout the piano industry, then personally I would avoid it. You normally don't get "something for nothing" regardless of what that ad or seller might say. BE CAREFUL out there and contact me 1st before you buy! The features many people ask for in digital grand pianos are a good variety of higher quality instrument sounds including good acoustic pianos, strings, brass (a variety of horns), woodwinds, reeds, flutes, synthesizers, guitars, world instruments, and others. Some people also ask for a good helping of drum rhythm patterns, ensemble style chord backing tracks, easy play features, a bigger user interface screen, a mic input for singalong/karaoke, extensive recording & song playback options, an authentic acoustic piano feel, and a full sounding speaker system. Polyphony note memory/processing power can be anywhere from 64 notes to 256 or (unlimited) notes or more, and more polyphony can be important, especially if you are a more advanced player with a much higher skill level or are doing extensive recording or multiple sound layering. However for normal use in most families, 120 to 256 notes of polyphony should be sufficient. In addition to all this, it seems everyone wants the most attractive digital Baby Grand piano they can get with the realistic authenticity in cabinet design and function and they want it all for generally around $5000 or less, although there are people who can and are willing to spend more money to get what they want, but they are in the minority of buyers. The problem with wanting to get a good digital baby grand piano is that you will usually need to make some sacrifices to get what you want in the lower price range. Yamaha, Roland, & Kawai are all great digital piano manufacturers and do produce some exciting and impressive digital Grand Pianos in small & larger sizes, but they are generally not in the $5000 or less price range. In fact those models which include the newer Yamaha CLP665GP, CLP695GP, CVP709GP, AvantGrand N3X, Roland GP607, Roland GP609, and the Kawai CP1, are all normally priced at well over $5000 and on up to approx $22,000...so they're not cheap. Casio also produces many popular digital pianos but does not produce one in a digital grand cabinet. So what does that leave you if you cannot get a Kawai, Roland, or Casio for less than $5000 which are the more well known and higher quality digital piano companies that make a good product? It generally leaves you with either "no-name" cheaper quality digital pianos which are overall not very good in their ability to replicate a good piano playing experience, the new Yamaha CLP665GP mini grand for around $5500-$6000 discount price depending on the dealer (this one is quite nice), the Kurzweil MPG200 and Roland GP607 at $7000 (plus tax) which look nice but the Kurzweil has some negative sound issues in my opinion and is way overpriced, or the Samick digital grands for about $4000-$5000 which are very nice for their lower price. There are some digital pianos brands I do not recommend under $5000 (based on years of personal experience) and this is because they have noticeably poor piano tone, key response, key action, tonal dynamics, key velocity realism, and other digital features. I refer to them simply as GPSO's..."Grand Piano Shaped Objects" and little more than that:) They don't play good, sound good, function well, or hold up good over time based on my experience with them. I have been around most of these brands and various models my entire music career and there are just certain ones that have not improved much and still are on my "not recommended" list. Those brands include Suzuki (most of them), Artesia, Adagio, Williams, Kurzweil and a small variety of "house or private label brands." A house brand is one that is sold by a piano or music store and they buy a pre-made digital piano from Chinese manufacturers and have their own name put on the piano so that they can have an "exclusive" name that no one else has. It makes marketing and promotional sense for the music store to do that, but it certainly does not mean it's a good piano and it tends to be confusing in trying to find out what these things really are and who actually makes them. Cameron & Sons is one of those "house brands" as is Williams, Adagio, & Suzuki. I have seen Cameron & Sons occasionally on the internet (never played one yet because they are not a real piano company) but that brand does not say where the piano is manufactured (there is no Cameron & Sons factory) and the specs in the digital pianos highly suggest they are one of the inferior brands that are similar in nature to Suzuki which I advise everyone to stay away from. If you don't know where the piano is built, who builds it, or what is really in it, then the words and descriptions mean little or nothing... I have seen it all before. Not all house or private label brands are bad (some are good because they have control over the quality or technology used and have it built by reputable manufacturers) but it is not common. Artesia is an actual Chinese brand you made not have heard of before which builds there own digital pianos in China, but I have actually played them and was definitely not impressed with tone, key action, or construction and these are the main ingredients that need to be good in a digital piano. I would definitely stay away. They all have noisy key actions, little or no dynamics in piano sound, and low quality, uneven velocity sensitivity. From time to time I do see some positive on-line consumer reviews on some of these brands or models that I do not recommend. But I look at these consumer reviews knowing that those people cannot possibly have ever played a real acoustic piano (either upright or grand) at any skill level at all. 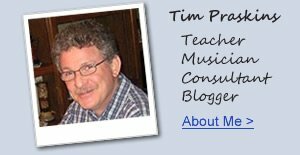 If they had, they wouldn't be giving positive reviews of these low quality digital pianos (in my professional opinion). You just can't believe everything you hear or see...especially from uneducated consumers who think they have something good, when in fact they just don't know how bad it really is! As far as digital Baby Grand features go, it's great to have lots of exciting functions and they can be fun to use, and even the low quality baby grands may have some of them. But if you cannot get a quality piano as far as the piano sound & necessary elements like a good responsive key action go, then I don't believe it really matters what else is in the piano. In the lower quality pianos, even those extra functions are generally not very good much of the time. The Artesia brand which I previously mentioned is sold primarily by Costco, and just because Costco has them does not mean they are necessarily good pianos. Artesia is really not a brand (as far as having their own manufacturing facility) and they are normally all Chinese designed and made, which is not necessarily a bad thing...it just depends on the parts they use. Suzuki is also not a brand in the traditional sense and they do not build their own pianos since they are pre-built in China by another company incorporating cheaper electronics and cheaper key actions in many (but not all) of their models. 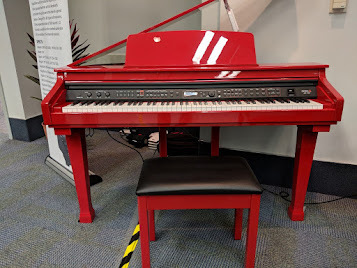 The Suzuki piano also brand has nothing to do with any most other Suzuki products made either including motorcycles, cars, violins, lessons, and other things connected with their name. I've done a number of reviews on Suzuki, Artesia, Williams (a Guitar Center brand) and Adagio pianos and have been very disappointed with most of them, especially with their key action, velocity response, tonal dynamics, and quality (as I mentioned earlier), and I have personally played them. It is also important to know that just because a piano is completely or partially made in China does not mean it's bad as I mentioned, and I don't want people to think that. 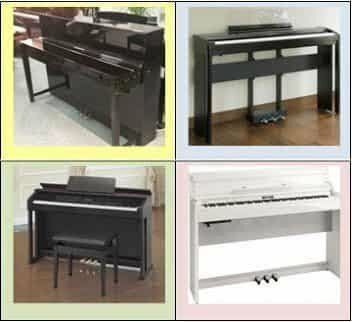 There are some very good piano manufacturing facilities in China now and even Yamaha & Kawai get a number of their pianos made there these days. Whether we like it or not, we all live in a world economy and China is a big part of it. 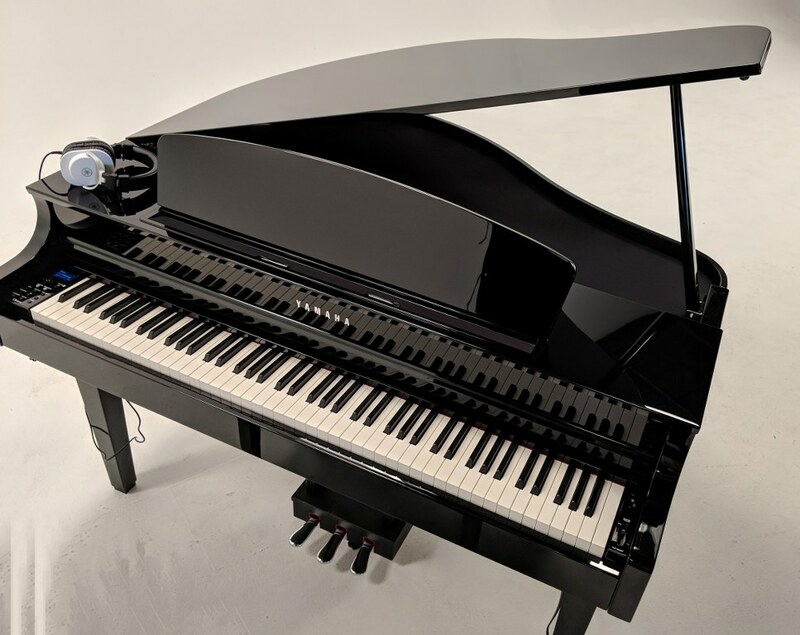 As long as the piano is produced with good oversight, good construction, professional design, and reliable technology with up to date musical features, that's what really counts and the brand name is not the always the issue. When it comes to digital pianos, generally speaking, you can get more piano realism and features for the money ($5000 or less) if you don't get a Baby Grand cabinet and instead get a regular vertical upright style furniture cabinet. You do pay a premium for a digital Baby Grand furniture style cabinet but the look and sound of those instruments are certainly impressive and elegant and if you plan to own it for a long time and you have the "disposable income," go for it and enjoy...I would recommend it. Those cabinets come in sizes from about 2'4" deep up to 5'3" deep from front to back of the cabinet and they average somewhere between 3-4' deep and weighs approx between 150 lbs and 350 lbs. Regular acoustic grand piano cabinets range in size from 4'7" deep to well over 7' deep and weigh well over 800 lbs. So there certainly are benefits in owning a digital grand in saving space and reducing weight so the piano can be more easily moved. 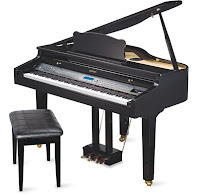 what is the best piano (digital) i can buy for no more than exactly 2500. that has the best sound/action and with the best/most bells and whistles that will take up the LEAST amount of room. I dont care if its upright or a grand style....Im handing you (vitually of course) $2500. to spend not a penny more. What would you choose? This is where I am right now. I had a console organ, valued at $21,000, which will be replaced through an insurance claim. I would like to replace it with a digital mini grand (don't have room for a larger grand) which can also be used as a player piano. I expect the insurance company may come back with a lower value, but I should have a substantial amount to spend. What would you recommend? The insurance company will only reimburse what I actually pay, so the less I spend, the less they pay. Are there any digital pianos that will hold their value and could be considered an investment? Thanks for any advice. I have the opportunity of purchasing a Suzuki gp-7. A mini grand piano for $950. I talked him down from $1300. It is in great shape and functions 100%. Is this a good deal? Where can I find a digital baby grand that is the actual size of a real baby grand? All I have seen are micro baby grands.